It's kind of funny... when I was offered the chance to review Catdog, I was thinking "It's a cartoon! That won't fit on my blog." Then as I was about to log off my email, a voice behind me said "Catdog! I love that show! Mom, you have to get it!" My youngest kids are 12 and 8 years old... so they've actually only seen a couple of re-runs of Catdog. On the other hand, my oldest kids grew up watching it and have, I'm sure, seen every episode ever made. So in our family, as the saying goes... "Everything old is new again!" I miss some of the older cartoons and prefer many of them over what is on today. My kids love watching them and some, like Catdog, actually have a moral to them. We enjoyed it! 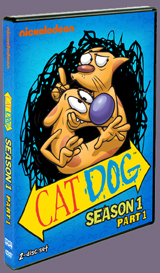 A fan favorite, CatDog: Season One - Part One, is a tale of opposites attached starring CatDog, the most unlikely brother duo ever seen. The conjoined brothers love each other yet they are so different, they can’t help but annoy themselves silly with their contrarian activities. Prim and proper, Cat is the very definition of culture, while Dog is the ultimate tail-wagging, sofa-jumping, car-chasing roughneck. But despite their very different personalities, CatDog are the best of friends, sticking to one another — literally — through thick and thin, even when it comes to facing off against their devious neighbor Winslow and the rough ’n’ tough gang of Greaser Dogs! Created by Peter Hannan, CatDog premiered on Nickelodeon in1998 and ran for four seasons until 2001. Reruns aired onNicktoons from 2002 to 2011. Nickelodeon, now in its 32nd year, is the number-one entertainment brand for kids. It has built a diverse, global business by putting kids first in everything it does. The company includes television programming and production in the United States and around the world, plus consumer products, online, recreation, books, and feature films. Nickelodeon’s U.S. television network is seen in more than 100 million households and hasbeen the number-one-rated basic cable network for 16 consecutive years. Formore information or artwork, visit http://www.nickpress.com. Nickelodeon and all related titles, characters and logos are trademarks of Viacom Inc. (NYSE: VIA, VIA.B). Drew Manning's Journey From "Fit 2 Fat 2 Fit"